Florence Mall?, Nope?, How about Ya’ll! 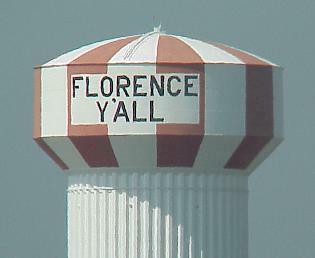 Anyone driving south to or from Cincinnati on Interstate 71/75 has had the pleasure of being welcomed to Florence by a giant water tower with “Florence Ya’ll” painted in large letters on the side. However, what is now a well-known friendly greeting into Florence originated due to a legal dispute. Built in 1975, the Florence water tower originally was built to supply water to the not-yet-built shopping center and surrounding area. The mayor of Florence at the time, C.M. “Hop” Ewing, struck a deal with the developers of the shopping complex. The mall would agree to paint the tower and, in exchange, the city would allow them to paint the words “Florence Mall” on the tower for all highway travelers to see. The water tower turned billboard advertisement would prove to be short lived however, after the mayor received admonitions from the highway department. The water tower violated regulations set forth in the “Highway Beatification Act” signed by Lyndon Johnson in 1965 which prohibited advertising signs for non-existent entities within 660 feet of the highway. The city faced fines if they failed to quickly come up with a cost-effective way to remove the word “mall”. In a stroke of genius, mayor Ewing and city representatives proposed changing the “M” to a “Y,” and adding an apostrophe. The alteration only cost $475 (compared to the $1,200 it cost to paint over the whole word), and just like that, a landmark for the gateway to the south was born. At the time, most people thought the mall would repaint their monstrous advertisement when they finished construction of the complex, but the developers had already given the land to the city. Since the developers had no control over land the developers didn’t own, the city of Florence decided “Ya’ll” would stay. The word “mall” likely would have violated other portions of the Highway Act anyway, since the Act banned advertisement billboards of all forms unless they fell under one of the exceptions of the bill. What started as an easy way to save money on a paint job turned into a point of pride for the city of Florence, and a clear sign for highway goers that they have officially entered the south! Kelly Kazek, How the ‘Florence Y’all’ water tower became a southern icon, Southern Thing, https://www.southernthing.com/how-the-florence-yall-water-tower-became-a-southern-icon-2579211222.html?rebelltitem=1#rebelltitem1 (June 18, 2018). Justin Duke, Florence Y’all: From napkin scribble to NKY landmark, CIncinati Enquirer, https://www.cincinnati.com/story/news/local/florence/2016/07/12/florence-yall-napkin-scribble-nky-landmark/87012174/, (July 12, 2016).